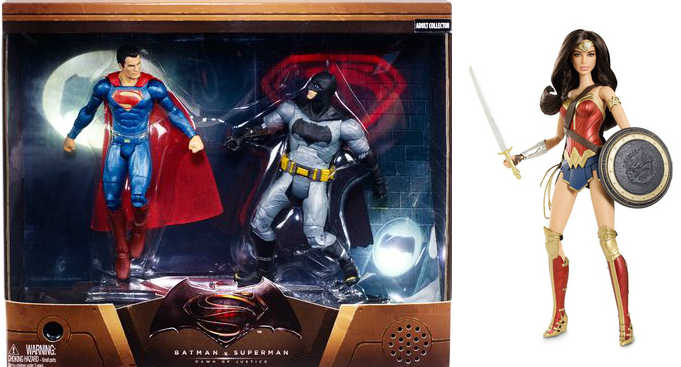 These are the first Batman V Superman figures I’ve seen, and they look fine. In fact, it’s the look I want to talk about. So, Wonder Woman is a Barbie for some reason… at least she’s not all out of proportion. That doesn’t bother me so much. What is sticking in my proverbial craw is that from the first time I saw the Batman costume, I couldn’t help but shake my head at the giant bat symbol on his chest. It’s just too big… and then today, I finally noticed that the symbol on the costume is different than the logo that DC and Warner Brothers are plastering everywhere. How the hell did they let that happen? And what’s worse, how’d the let the inferior design end up on the costume? This is, to me, a bad sign. If you’re making a $200 million dollar movie, there’s bound to be a lot of people and a few miscommunications, but jeez, you can’t even getting marketing to agree with the damn product? It’s not like this is some silly snafu with the Wayne Enterprises logo, this is the breaking Bat Symbol on Batman’s chest! Who knows, maybe it’ll come out ok… but the doubts are starting to pile up in my mind.